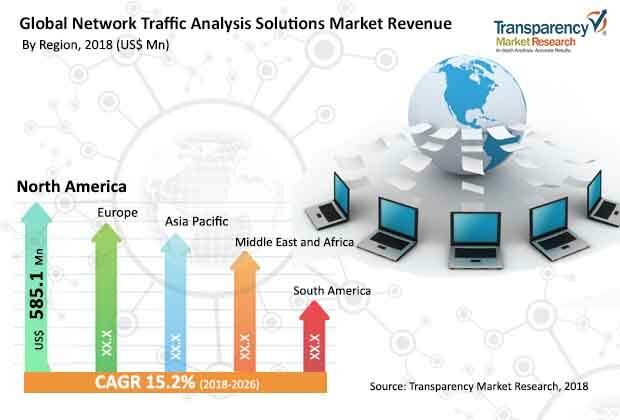 According to a new market report published by Transparency Market Research, the global network traffic analysis solutions market was valued at US$ 1,527.6 Mn in 2017 and is expected to expand at a CAGR of 15.2% from 2018 to 2026, reaching US$ 5,339.7 Mn by the end of the forecast period. According to the report, North America was a significant contributor in terms of revenue to the network traffic analysis solutions market in 2017. This is primarily due tothe presence of a large number of network traffic analysis solutions vendors in the region. Most of the players focus on providing advanced solutions to organizations so as to gain a competitive edge in the market. Rise in the use of smart devices and increase in IT security budgets are major factors that are expected to fuel the network traffic analysis solutions market across the globe. In the modern age, almost all industries require computers and the Internet in order to execute their work. The work is mostly done through websites or web-based applications. Increase in the use of the Internet worldwide opens new doors for data breaches and attracts new cyber-attacks on end-users across various sectors. Therefore, to minimize/eliminate the chances of cyber-attacks, various organizations are compelled to increase their IT spending on advanced network security solutions. This, in turn, is expected to drive the network traffic analysis solutions market during the forecast period. Furthermore, proliferation of 5G technology is anticipated to create new opportunities for the growth of the network traffic analysis solutions market around the globe. Based on geography, the global network traffic analysis solutions market has been categorized into North America, Asia Pacific, Europe, South America, and Middle East & Africa. The market in North America is expected to maintain its dominant position throughout the forecast period. However, Asia Pacific and Europe are also expected to constitute significant market share in the coming years. Key players operating in the global network traffic analysis solutions market include GREYCORTEX s.r.o., Genie Networks, Flowmon Networks, Zoho Corporation, Hewlett Packard Enterprise Co., Ipswitch, Inc., Cisco Systems, Inc., Bricata, Inc., CA Technologies, Palo Alto Networks, Inc., Netreo Inc., Dynatrace LLC and Netmon Inc.